Tummy Tuck Seattle, also known as abdominoplasty, is a surgical procedure that plastic surgeons like Dr. Javad Sajan perform to reduce the size and shape of a patient's abdominal area. During the surgery, excess fat and skin from the middle and lower abdomen is removed and abdominal muscles are tightened. Come visit Dr. Sajan for some of the best results from a tummy tuck Seattle has to offer. A healthy diet, regular exercise, and a positive lifestyle are important to the care and maintenance of your body. But sometimes, no matter how many sit-ups and crunches you do, or the number of low-cal salads you eat, excess fat can accumulate at your waist – and stay there. Some Seattle abdominoplasty candidates have lost a considerable amount of weight but still have remaining fatty areas along with a considerable amount of excess loose skin that had been stretched too much to resume its original tautness. The primary benefit of a Seattle tummy tuck is the way it's able to transform your physique. When performed correctly, it can restore the taut stomach you enjoyed before your abdomen was damaged by weight loss, pregnancy and the natural aging process. When you feel good in your body, your confidence increases. A flatter stomach can boost your self-esteem, especially in the summer months when you're able to wear a bikini once again. If your underlying muscles are severely lax, there isn't much you can do to tighten the area without surgery. A tummy tuck can restore tone and definition to your muscles in a way that exercise simply can't accomplish. During pregnancy, the abdominal skin stretches and the underlying muscles separate, resulting in poor muscle tone and skin elasticity that persists, even after the pregnancy weight is gone. When this occurs, a tummy tuck with Dr. Sajan as your surgeon can be the best way to restore your desired shape and tone and rediscover your pre-pregnancy figure. Losing a substantial amount of weight is a huge accomplishment. However, many people find that they're left with sagging skin and stretched abdominal muscles that make them feel extremely self-conscious. A tummy tuck can address the extra skin and elasticity issues, delivering the contoured body you've worked so hard to achieve. As we age, abdominal skin naturally loses its elasticity. When this occurs, a tummy tuck can tighten and contour the entire area, restoring a more youthful and fit silhouette. How your body accumulates fat is largely influenced by your genetics. As such, you may simply be predisposed to gain weight in your midsection, no matter how much you exercise and watch what you eat. Fortunately, a tummy tuck is the ideal way to address this issue, as it allows you to meet your body goals regardless of your genes. To be considered an ideal candidate for a tummy tuck with Dr. Sajan, premier plastic surgeon, you should be in good general health and want to address excess weight and droopy skin around your midsection. In addition, you should be close to your ideal weight, have reasonable expectations for what the procedure can accomplish and be dedicated to maintaining your results with a healthy diet and exercise plan moving forward. Conversely, if you have plans to lose a substantial amount of weight or become pregnant, or if you have a serious medical condition that could impair healing or increase your risk during surgery, Dr. Sajan will likely recommend postponing the procedure. Your consultation with Dr. Sajan is your opportunity to learn about how a tummy tuck can transform your appearance. To begin, he will talk to you about your goals for the procedure to make sure you have realistic expectations. From there, he will evaluate your skin and muscle tone, before taking detailed measurements of your abdominal area. Based on the results of his examination. Dr. Sajan will talk to you about your options for surgery, including cost, incision placement and anticipated results. From there, he will develop a custom treatment plan that's tailored to your needs and objectives. Before moving forward with your procedure, Dr. Sajan and his staff will counsel you on what to expect before, during and after your surgery, to ensure that you're thoroughly prepared for the experience. You can expect your Seattle abdominoplasty to be performed in our state-licensed surgery center. To begin, we will administer a general anesthesia to ensure your comfort and safety, before making an incision low on the abdomen that reaches from your left to right hip. Dr. Sajan will be sure to place this cut strategically, to ensure that you can easily hide the resulting scar with underwear. Through that opening, Dr. Sajan will remove excess fat, trim excess skin, and manipulate the remaining skin and muscle as much as needed to contour them to a smoother, tighter appearance. An incision may also be made around your navel to facilitate easier removal of excess skin above the belly button. After the remaining upper abdominal skin is pulled down and sutured to the skin in the lower abdomen, a new opening for your navel will be created. Dr. Sajan may insert temporary drainage tubes under your skin before closing the incisions and applying dressings or bandages. You may be asked to wear a compression garment for a period of time following surgery to help minimize the resultant swelling and support your abdomen during healing. Dr. Sajan will provide a detailed set of instructions for you to follow. You will have important information on how to care for the surgical sites, topical and oral medications to help facilitate healing and your comfort, concerns to be alert for at the surgical site, and your schedule of follow-up appointments. Carefully following these instructions will optimize your recovery and results. The results of your tummy tuck will be almost immediately evident. Swelling will take time to resolve and strenuous activity will be extremely limited for up to six weeks. You may need to plan on taking at least a couple of weeks of recovery before returning to work and follow Dr. Sajan's recommendations regarding what activities you may add back into your daily life, and when. As with all surgical procedures, there are some inherent risks associated with our Seattle tummy tuck surgery. Although Dr. Sajan does everything within his power to avoid these complications, he believes that it's important for patients to be aware of possible unfavorable outcomes prior to surgery, so they can make an informed decision that is in their best interest. Most of Dr. Sajan's patients in Seattle and surrounding areas are committed to maintaining their tummy tuck results for as long as possible. They know what it feels like to suffer with unwanted fat, lax muscles and sagging skin, and they want to prevent those effects from occurring again. Fortunately, with the proper maintenance and care moving forward, it's possible to preserve your tummy tuck results for many years to come. To ensure that your stomach remains flat, you will need to adopt a healthy diet and exercise plan. Try to avoid processed, high-fat and sugary foods, and engage in moderate aerobic exercise daily to keep excess flab at bay. 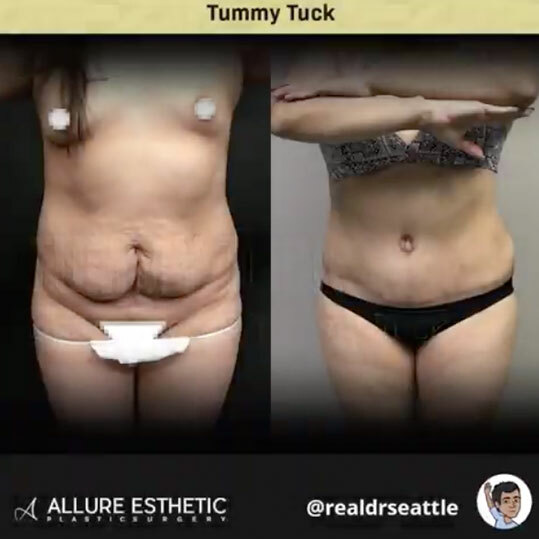 Our Seattle tummy tuck can transform the way you look and feel about yourself. Contact Dr. Sajan's Seattle office today and schedule a consultation to discuss the ways a tummy tuck may benefit you.